You don’t have to tell us twice about the benefits of eating seaweed. We actually love the stuff – from kelp noodles to nori sheets. But did you know that postpartum moms can especially benefit from these power-packed sea vegetables? Jin Jun is the founder of Seasnax, the little nori snack sheets we love to swap in to our afternoon snack rotation. We found out that the brand also offers dried seaweeds especially for new mothers. The seaweeds, like hijiki and kombu, are used to create an especially rejuvenating post-delivery soup that is commonly used in Korean culture. Whether you’re seeking post-pregnancy balance or not, these insights from Jun, an expert in Traditional Chinese Medicine and impassioned advocate for the healing power of traditional foods are great for sharing with a pregnant friend. The soup is great for anyone’s health – we love a mug of this first thing in the morning as a rejuvenating tonic after a long night out! The Chalkboard Mag: Jin, first, what are the benefits of eating seaweed? Are there different benefits to the different types of seaweed? Jin Jun: In his new book, “Secrets of Longevity Cookbook,” Dr. Mao Shing Ni lists seaweed as one of the top 10 foods for health and longevity. Dr. Mao is the founder of YoSan where I studied Traditional Chinese Medicine and he is also my teacher. Considered the king of vegetables, seaweed has roots that penetrate into sea beds that are filled with trace minerals, which are no longer present on land. For thousands of years, this mineral-rich vegetable has been a staple in Asian diets. There are more than 20 types of edible seaweed, including nori, kombu, hijiki, wakame, dulce, chlorella, and Irish moss. TCM: What physical conditions are seaweeds most commonly used for in Chinese medicine? JJ: Traditionally in Chinese Medicine, the healing properties of edible seaweed are said to include everything from lowering cholesterol and detoxifying heavy metals to dissolving tumors and cysts. products. They are pretty unique, what inspired you to make this product for pregnant and postpartum mamas? JJ: While earning my Masters in Acupuncture and Traditional Chinese Medicine at YoSan University, I developed a keen interest in nutrition as a tool for prevention of disease, self-healing and self-empowerment. I began to view nutrition and food as medicine for the soul and body, and every meal as an opportunity to heal. While in school, I gave birth to our daughter Namu (tree in Korean). During my pregnancy and motherhood, my understanding and appreciation for nutrition and health gained more relevance as I realized that it was no longer about me, but we. I wish to share these simple yet sacred traditions with mothers and families so that we may all enjoy greater health and happiness. TCM: What’s the story behind the traditional connection between postpartum and seaweed consumption? JJ: For centuries, new mothers in Korea have replenished themselves with seaweed soup to assist in their postpartum recovery and rejuvenation. According to ancient Korean folklore, this postpartum tradition was learned from observing female whales that would seek out and eat strands of seaweed after giving birth. This story is what inspired the design of the mother and baby whale on the SeaMama line. Seaweed soup still remains a staple food in a new mother’s postpartum diet in Korean culture. After giving birth, women traditionally eat seaweed soup every day for three straight weeks. According to Korean elders, the nutrients found in seaweed are said to nourish and rejuvenate the mother to help bring her body back into balance and well-being. This soup is also served on one’s birthday (mi-yeok gook), like a birthday cake, so to speak. For these reasons, seaweed holds a meaningful and close connection to birth and life. Today, seaweed is recognized as a vital part of healthy and natural diets worldwide. SeaSnax is delighted to share this special tradition and delicious recipe for rejuvenation.
! Can you inspire us with a few unique ways to use them? JJ: Fold them into four squares (easier to roll in smaller squares). Place about two tablespoons of steamed white or brown rice in the center of each square. Slice fresh mango, avocado and top with a few dried cranberries. Women love the sweet and salty combination of flavors, and so do most of us! TCM: What other favorite traditional Chinese foods do you advocate, love and think people can learn more about? JJ: Jook, various types of Korean rice porridge in Korean. Jook in Korean culture is a comfort food. Whenever we were sick as children our mother always cooked us homemade jook. It’s kind of like our chicken soup, so to speak. TCM: What are other great resources can women rely on during and after pregnancy? Heat 1 Tbsp of sesame oil in a pot over medium heat. Lightly sauté shiitake mushrooms (or meat) until brown. Add chopped garlic for added flavor. Add 1 1/2 quarts of filtered water and bring to a boil. Add SeaMama wakame seaweed (no need to soak or wash). Simmer for additional 20 minutes on medium heat. Add tamari or soy sauce, sea salt and pepper to taste. Serve with rice for a hearty soup meal. You can refrigerate unused portions for 3 days, or freeze each serving and eat over a month. Share the post "The Seaweed Solution: A Revujenating Tonic for New Moms"
This is very common post partum dish served in Korean culture. 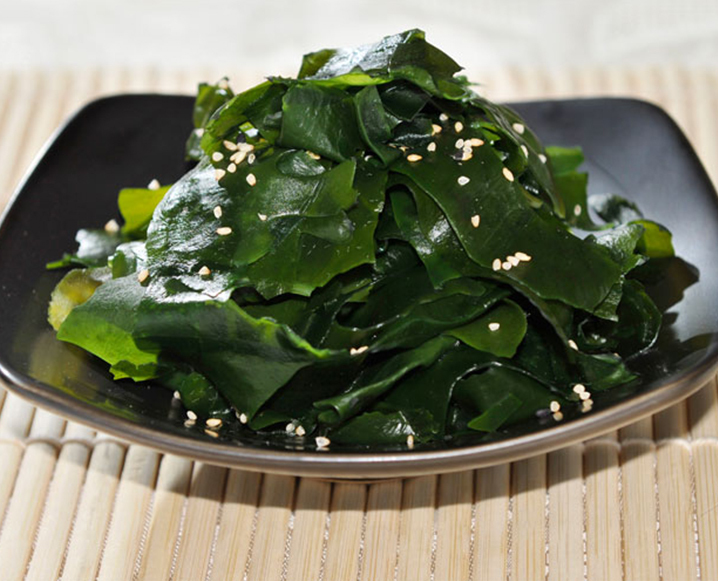 However, people with thyroid problems should not consume seaweed as it interferes with their thyroid levels.